Here are some details of letterpress courses I’m teaching this June & July in Distillers Press and The National Print Museum. I’m a bit late advertising as the one day course in the National Print museum has already booked out but do keep an eye on their website for future courses. Designed for beginners or those with some knowledge of typography, graphic design or relief printing, this new course offers a fantastic opportunity to gain access to the Distillers Press, the only working letterpress facility in third level education in Ireland. The course will begin with an induction to the workshop, an overview of letterpress printing with examples of artists’ & designers’ work, an explanation of hand setting and an introduction to the use of the press. Following the first day’s introduction participants will cover two-colour printing and the use of wood and metal type to create their own work under supervision. This may take the form of prints, posters, simple books, cards or stationery, printed in a small run. 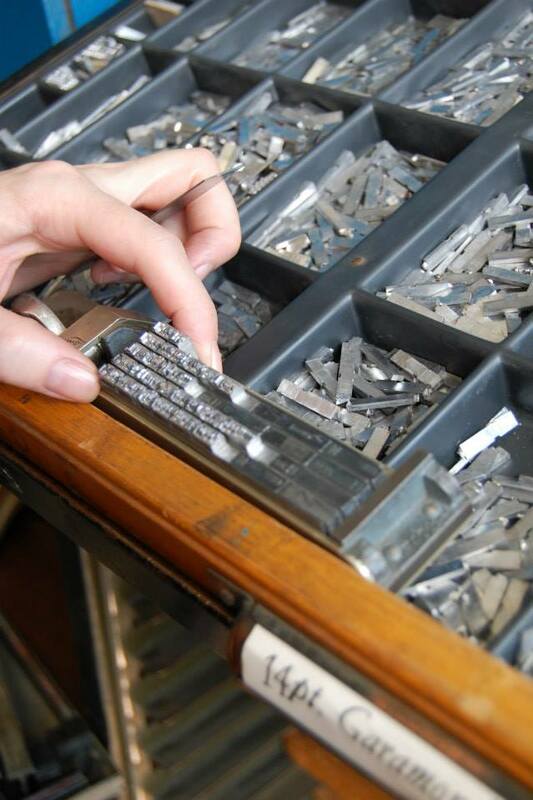 The course will provide an excellent overview of the processes and materials involved in letterpress printing. A certain amount of quality paper will be provided but additional sheets may be purchased during the course if needed. Max. 8 people. This course will introduce people to letterpress printing, specifically using the Vandercook proofing press. After an introduction to the typecase and instruction on how to set type, each participant will set their own piece of text using metal and/or wood type. Each participant should prepare a short quote, saying or excerpt of prose or poetry that they would like to set and print. The result will be a card or small print in a short edition. I am hoping to come to Dublin, Ireland in the spring of 2017. I would like to take an intermediate or advanced course in letterpress while I’m visiting your country. Or rent studio time. Knock on wood, I hope to stay for about 3 months, and rent a place to stay in Dublin and in Donegal as well. My great grandfather was born in Dublin and his family moved to Canada when he was a baby. I am using this trip to trace my ancestors’ footsteps, do some site seeing and to take a course or rent studio time in a letterpress studio. You can see some of my letterpress work on my FB page to get an idea of the type of work I do. I know this is quite a ways into the future and I want to get a feel of what’s available in Dublin for letterpress. I think I’ve already been in contact with you through Graphic Studio Dublin! Do make contact when you know the dates of your trip – it would be lovely to meet you!